Mount Ontake erupted at 11:52 am on September 27, 2014, which generated pyroclastic density currents, ballistic projectiles, ash falls, and a small-scale lahar that spouted directly from craters formed by the eruption. Because this lahar may have been generated by water released from within these craters, we refer to this lahar as a “syneruptive-spouted type lahar” in this study. The lahar of the 2014 eruption was small relative to the other syneruptive type lahars reported in the past that were snowmelt type or crater lake breakout type lahars. Nevertheless, in the 2014 event, the syneruptive-spouted type lahar extended approximately 5 km downstream from the Jigokudani crater via the Akagawa River, with an estimated total volume of ~1.2 × 105 m3. We have reviewed other representative syneruptive-spouted type lahars that have been reported in Japan. The syneruptive-spouted type lahar attributed to the September 2014 eruption had the longest runout distance and largest volume of all cases studied. The mineral assemblage identified from samples of the lahar deposits is similar to that of ash-fall deposits from the same eruption. Previous workers deduced that the ash was derived mainly from shallow depths (within 2 km of the surface). The syneruptive-spouted type lahar deposits are therefore also considered to have originated from shallow depths. A syneruptive-spouted type lahar is a small-scale phenomenon that causes little direct damage to infrastructure, but has long-term influence on water quality. Increases in turbidity and decreases in pH are expected to occur in the Mount Ontake area downstream of Nigorisawa after heavy rainfall events in the future. Therefore, the potential indirect (but long term) damage of syneruptive-spouted type lahars should be considered for hazard mapping and planning volcanic disaster prevention measures. Mount Ontake (3067 m) is an active stratovolcano located at the prefectural border of Nagano and Gifu in central Japan (Fig. 1). Mount Ontake erupted at 11:52 am on September 27, 2014, which generated pyroclastic density currents, ballistic projectiles, ash falls, and a small-scale lahar that spouted directly from craters formed by the eruption (Nakano et al. 2014; Oikawa et al. 2014; Kaneko et al. 2016). Because this lahar may have been caused by water released from within these craters, we refer to this lahar as a “syneruptive-spouted type lahar.” Similar lahars have been documented from the Mount Usu eruption of March 2000 (Mizugaki et al. 2001; Hirose et al. 2007), the Meakandake eruption of March 2006 (Sasaki et al. 2006), and the Hakone eruption of June 2015 (Mannen et al. 2015). For this study, we have assessed the distribution of syneruptive-spouted type lahar deposits using oblique aerial photographs, analyzed their morphology, evaluated the mechanisms of their generation, investigated their indirect impacts, and compared them with other examples of this type of lahar documented in Japan. Workers affiliated with Asia Air Survey Co., Ltd., captured oblique aerial photographs of the outside of the prohibited area on September 28, 2014, the day after the September 2014 eruption (Figs. 2, 3). The area surrounding the summit of Mount Ontake was covered by gray-colored ash fall (Fig. 2a), which was most prominent northeast of the crater and turned vegetation in the affected area gray (Fig. 2b). The pyroclastic density current deposits were distributed northwest and south of the crater, and their coverage is also shown by a gray color in the oblique aerial photographs (Fig. 2c, d). Maeno et al. (2016) estimated a total volume of ash-fall and pyroclastic density current deposits of 0.7–1.3 × 106 m3. The syneruptive-spouted type lahar flowed into the Nigorisawa River on the south side of the Jigokudani crater (Fig. 3a). The Jigokudani crater could not be seen in the photographs because of smoke, but a gutter of water from a crater wall could be identified (Fig. 3b). Photographs showing that the lahar overflowed from the Jigokudani crater have been presented by Kaneko et al. (2016). The western crater is a new crater that formed during the 2014 eruption. Flowing water was observed around this new crater and the tongue-shaped lahar, and its presence was confirmed at the bottom of the new crater (Fig. 3c). The ejected volume from this part of the eruption was very small and therefore is not essential to the following discussion. 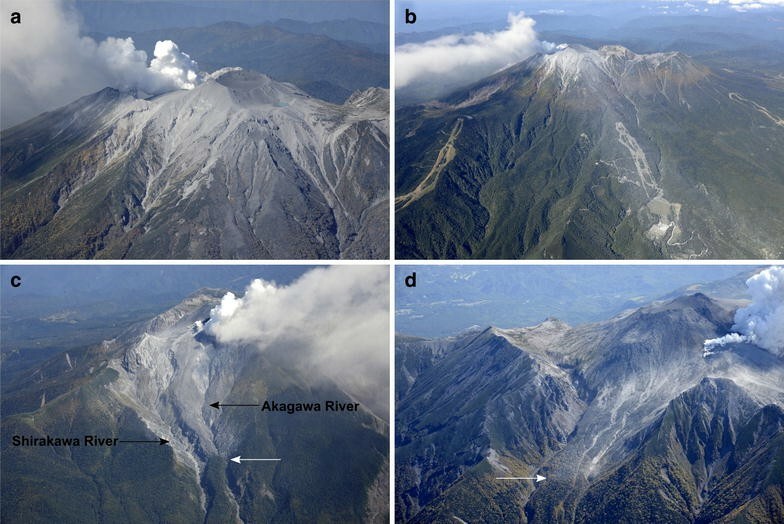 Although the pyroclastic density current deposits were partially eroded by the flow of the Shirakawa River, no large-scale reworking of these deposits has been recognized (Fig. 3d). In the Akagawa River, downstream of the Jigokudani crater, gray lahar deposits were observed on the valley floor (Fig. 3d, e). The lahar overflowed at the confluence of the Akagawa and Shirakawa Rivers. Muddy water mainly flowed downstream from site C (Fig. 3e, f). We have produced a distribution map of the syneruptive-spouted type lahar using oblique aerial photographs and red relief image maps (Chiba et al. 2008) (Fig. 4a) and differentiated the lahar from muddy water (Fig. 4b). The syneruptive-spouted type lahar travelled approximately 5 km downstream from the Jigokudani crater via the Akagawa River. Muddy water flowed downstream from site C and down the Otakigawa River until it arrived at Lake Ontake. The distance from the Jigokudani crater to the junction of the Nigorigawa and Otakigawa Rivers (site E) is ~11.5 km. The syneruptive-spouted type lahar deposits in the Akagawa River covered an area of ~1.2 × 105 m2 with a mean thickness of ~1 m, for a total volume of ~1.2 × 105 m3. We conducted fieldwork 10 months after the September 2014 eruption at four localities (sites A, B, C, and D), which are shown in Fig. 4. A check dam at site B was full of syneruptive-spouted type lahar deposits (Fig. 5a). A member of the Forestry Agency photographed site B on October 2, 2014. The syneruptive-spouted type lahar deposited material on the wing of the check dam, and desiccation cracks subsequently developed on the deposit’s surface (Fig. 5b). Because the front of the deposit had a lobate form, it is possible that the material was cohesive. Figure 5c shows the main stream of the Akagawa River near site B, which was photographed by a member of the Forestry Agency at 11:30 am on October 2, 2014. The lahar flowed through site B 5 days after the eruption. The syneruptive-spouted type lahar penetrated into a forested area, although it did not overturn any trees (Fig. 5d); nonetheless, a syneruptive-spouted type lahar deposit overlying a fallen tree was observed in the forest (Fig. 5e). At site D, a gray syneruptive-spouted type lahar deposit was covered in dark brown debris of a debris flow deposit (Fig. 5f), although the syneruptive-spouted type lahar had not arrived at the site by September 28, 2014, when the photograph was taken (Fig. 3f). According to Hayashi et al. 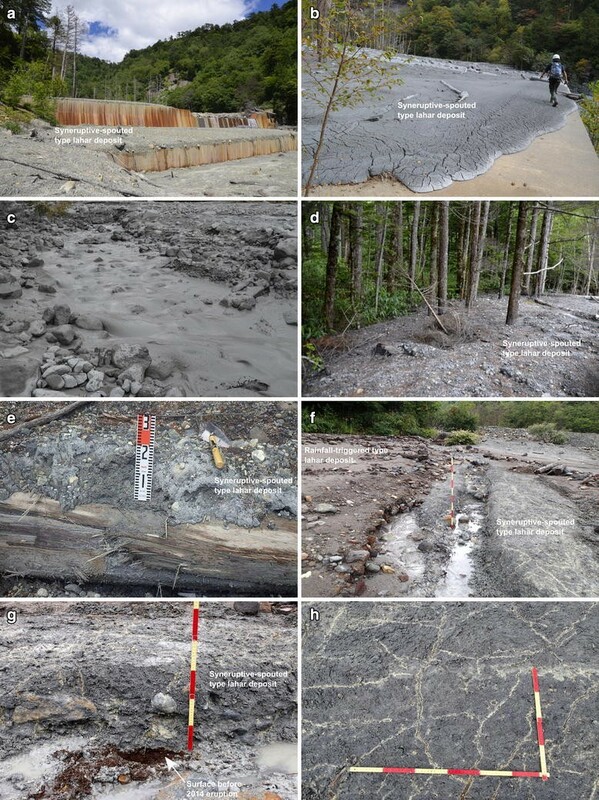 (2015), the syneruptive-spouted type lahar deposit arrived at this location on October 5, 2014, caused by typhoon rains; therefore, these lahar deposits may have been the result of post-eruption sediment reworking of the syneruptive-spouted type lahar deposits. Reticular sulfur-bearing veins developed in the lahar deposits (Fig. 5h), which were also filled with coarse sand from the debris flow. We analyzed the grain-size distributions of the syneruptive-spouted type lahar and debris flow deposits at sites A and D (Fig. 6). Grain-size distribution analysis was carried out using a test method for particle size distribution in soils (JIS A 1204: 2009). The debris flow deposit sample was predominantly composed of sand-sized particles, whereas the syneruptive-spouted type lahar samples were composed predominantly of silt-sized particles. The syneruptive-spouted type lahar deposits upstream were coarser than those downstream. This pattern resembled that of the 2006 eruption of Meakandake (Hirose et al. 2007). We collected samples of lahar deposits from sites A and D. Although the lahar deposit at site D was likely affected by rainfall, it was determined that it had the essential lithological characteristics of a syneruptive-spouted type lahar. Rainfall-triggered type lahar deposits contain mainly brown and orange, altered, and spherical lithic fragments and rarely contain white lithic fragments (Fig. 7a). However, the syneruptive-spouted type lahar deposits contained many white and angular lithic fragments (Fig. 7b). Juvenile fragments were not found in the syneruptive-spouted type lahar deposits. Pyrite only occurs in the syneruptive-spouted type lahar deposits (Fig. 7c). Minerals were identified using X-ray diffraction (XRD). We analyzed a sample of an ash-fall deposit from the same eruption to compare it with samples of the syneruptive-spouted type lahar deposits. XRD analysis was carried out using an XRD-6000 device (Shimadzu Corporation) with a Cu tube analytical setup and operating conditions of 30 kV. A bulk sample was dried and crushed to particles of ≤10 µm in diameter, and the powdered samples were placed in aluminum sample holders and analyzed. Sample fractions of <2 µm in diameter were extracted via elutriation for analysis. We prepared an oriented sample and an ethylene glycol-treated sample for the identification of smectite. The resulting XRD charts are shown in Fig. 8, and the identified minerals are listed in Table 1. The assemblage of hydrothermal minerals identified in all samples comprised quartz, plagioclase, cristobalite, alunite, gypsum, kaolinite, smectite, and pyrite. This mineral assemblage is similar to that of the ash-fall deposits from the 2014 eruption (Minami et al. 2016). The flow rate of the syneruptive-spouted type lahar was monitored by the Ministry of Land, Infrastructure, Transport and Tourism (2015) at the point where the flow entered the Makio Dam at Lake Ontake. Inflow and outflow fluxes recorded at this location before and after the 2014 eruption are given in Fig. 9. Rainfall on September 25, 2014, i.e., 2 days before the eruption, caused a temporary increase in inflow into the Makio Dam. Although there was variation with discharge, inflow did not increase significantly after the eruption; therefore, inflow from the lahar is interpreted to have been insignificant. The water quality in the rivers in the Mount Ontake area was monitored after the 2014 eruption by the Japan Water Agency, the Ministry of Land, Infrastructure, Transport and Tourism, the Nagano and Gifu prefectural governments (Fig. 10). We analyzed water quality data at three localities (W1, W2, and W3). At W1, through which the muddy water of the lahar flowed, very high turbidity was recorded following the eruption, although this turbidity gradually decreased. On the downstream side (W2) of the valley, where the pyroclastic density current deposited material, turbidity temporarily increased after the eruption, but decreased immediately afterward. Turbidity downstream (W3) of the area affected by ash fall was generally low, but rose during periods of rainfall. The pH at W1 decreased to ~4 after the eruption and continued to decrease during every subsequent rainfall event (Fig. 10). In contrast, the pH at W2 and W3 decreased shortly after the eruption, but stabilized at ~7 in the period afterward (Fig. 10). Lahars that occur after volcanic eruptions are often caused by melting snow or heavy rain (Vallance and Iverson 2015); however, neither snow nor a crater lake was documented near to the summit of Mount Ontake prior to the September 2014 eruption, although the groundwater level may have been particularly high because of heavy rain in the 2 days that preceded the eruption. Both a lahar and hot water were reportedly expelled from the Jigokudani cinder cone and the new western crater that developed during the eruption (Kaneko et al. 2016); therefore, we suggest that the lahars directly overflowed from the crater and that one reached as far as 5 km downstream. Therefore, we term the particular type of lahar investigated for this study a “syneruptive-spouted type lahar.” The syneruptive-spouted type lahar is thought to be a form of primary (syneruptive) lahar (Vallance and Iverson 2015). The syneruptive-spouted type lahar caused by the 2014 eruption was much smaller than other recorded syneruptive lahars, however, such as snowmelt type lahars or a crater lake breakout type lahar. The mineral assemblage identified from samples of the syneruptive-spouted type lahar deposits is similar to that of the ash-fall deposits from the same eruption (Minami et al. 2016). Minami et al. (2016) estimated that ash falls were derived mainly from shallow depths, within 2 km of the surface. The syneruptive-spouted type lahar deposits are therefore inferred to also have originated from shallow depths. We have reviewed representative syneruptive-spouted type lahars recorded in Japan (Table 2). Phreatic eruptions are not uncommon volcanic phenomena in Japan, although this type of lahar is extremely small in scale (e.g., the lahar associated with the 1992 eruption of Shinmoedake). 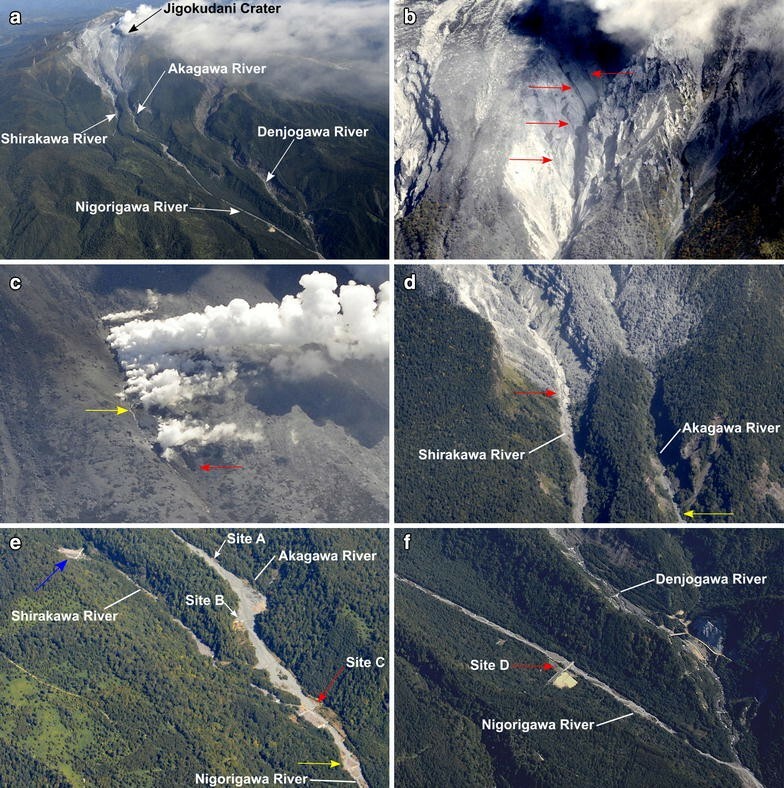 The syneruptive-spouted type lahar attributed to the September 2014 eruption of Mount Ontake had the longest runout distance and largest volume of all cases evaluated for this study. As of 2016, volcanic hazard maps for 42 of the 110 active volcanoes in Japan have been published by local governments; however, phreatic eruptions are noted as a potential hazard on only 22 of these maps. Furthermore, only three volcanoes (Meakandake, Hakone, and Garandake) have been noted as associated with syneruptive-spouted type lahars on these hazard maps. Predicting the occurrence of syneruptive-spouted type lahars alongside phreatic eruptions is challenging because the associated preeruptive phenomena, such as ground deformation and volcanic tremors, are very gentle and/or small in scale. In addition, a syneruptive-spouted type lahar is a small-scale phenomenon that causes little direct damage to infrastructure, although it may have long-term influence on water quality. An increase in turbidity and a decrease in pH are expected to occur downstream of Nigorisawa at Mount Ontake after every heavy rainfall event for several years. Therefore, syneruptive-spouted type lahars that could cause indirect, long-term damage should be considered in hazard mapping when volcanic disaster prevention measures are planned, as was done for the hazard map of the Iwaki Volcano after its 2014 eruption (Aomori Prefectural Government and Aomori Office of River and National Highway 2015). For other volcanoes, corrections should be made to their hazard maps to help create more effective hazard prevention plans. HS carried out the aerial photointerpretation, field research, and hazard map review and drafted the manuscript. TC conducted field research and analysis of samples and helped draft the manuscript. HK carried out field research and the review of similar phenomena. SN performed the analysis of indirect impacts. All authors read and approved the final manuscript. We thank Drs. W. Hirose and T. Kanamaru for their assistance in the preparation of this manuscript. We are grateful to the Kiso District Forest Office of the Chubu Regional Forest Office, Forestry Agency, for their assistance. We extend our appreciation to all staff members of Asia Air Survey Co., Ltd., for their assistance and support. This study was supported in part by the Research Subcommittee on Volcanic Engineering of the Geotechnical Engineering Committee, Japan Society of Civil Engineers.